You will love this charming 5-bedroom apartment in Berlin, Mitte borough. The apartment is located in the residential complex "Carre Voltaire". All the houses are built with an exclusively high-quality materials and modern construction technologies. It is a corner house located on the the intersection of the Kurfürstenstraße and Elsa Lasker-Schüler Strasse streets. Its special rounded corners has a relationship to the church, the twelve apostles and the tower of red brick. The architecture of this corner house harmoniously fits into the existing building of the street and symbolizes a fragment of the reconstruction of the central part of the city. In this case, not only the angle of the building, but also the urban houses located in a row of unified development with bay window elements of the facades, converging on both sides to the corner, is important. Apartments of different size and quality are oriented towards the street, the courtyard or the garden. This quality of housing, combined with characteristic architectural elements, includes the "corner house on the Kurfürstenstrasse" with its common modern constructive concept to the number of traditional historical buildings in Berlin, which are located in close proximity and in the neighboring streets. 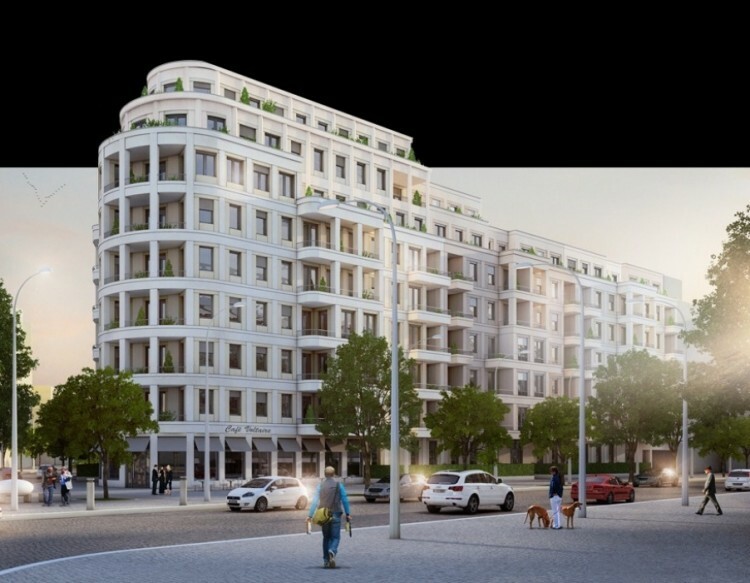 Do not miss a unique opportunity to have a new 5 - bedroom apartments in Berlin!